But for my money, few shows have made puzzles the centerpiece of storyline development and family interaction quite like The Simpsons. The first episode that comes to mind — and my personal favorite — is season 9’s Lisa the Simpson. In the episode, Lisa is stumped by a brain teaser and begins to worry about her intelligence, a concern that is only exacerbated by Grandpa’s revelation of the Simpson Gene, a genetic quirk that caused Homer and Bart’s descent from academic achievement to hilarious idiocy. In the end, of course, Lisa discovers she’ll be just fine — the defective gene is on the Y chromosome, so only male Simpsons are afflicted — and she conquers the brain teaser. Puzzly themes would continue to crop up in the show from time to time. 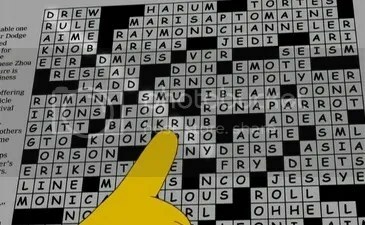 For instance, Homer discovers a secret acrostic message from his mother in the newspaper in season 15’s My Mother the Carjacker. 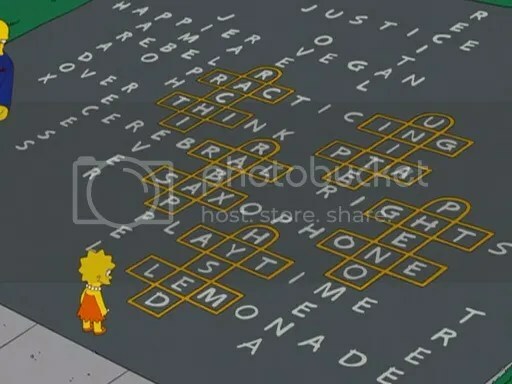 But most of the puzzle-centric goodness centered around Lisa. 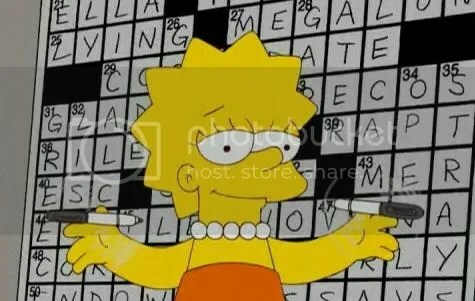 She indulged in palindromic fun with fellow Mensa members in season 10’s They Saved Lisa’s Brain, as well as an anagramming game in the season 6 classic Lisa’s Rival. But puzzles wouldn’t again take center stage until season 20’s episode Homer and Lisa Exchange Cross Words. 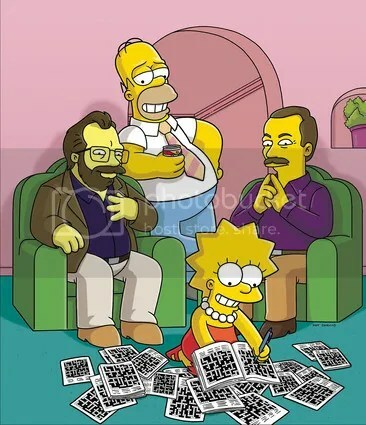 In the episode, Lisa quickly becomes a crossword fiend, solving all the puzzles she can and eventually entering the Crossword City Tournament. 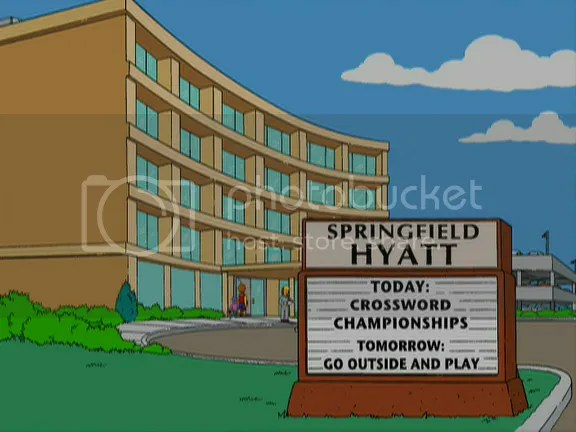 Trouble brews when Homer bets against her in the championship round, and their relationship fractures. 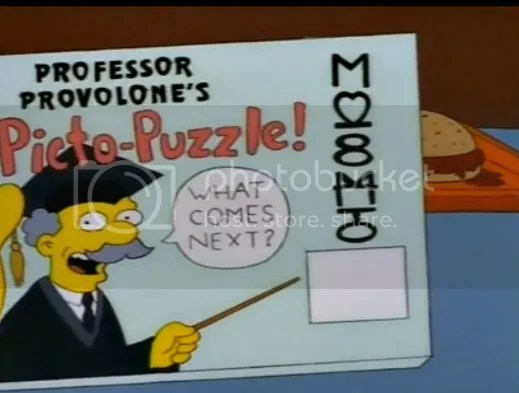 This was a real watershed moment in synergy for the show, since they somehow managed to convince The New York Times to publish the same puzzle in the paper that Homer uses to apologize to Lisa. It’s a real treat to see puzzles incorporated into a narrative like this. Instead of a time-killer or a mere passing interest, they become linchpins of each story. The puzzles create conflict, drive epiphanies, and bring people together. It’s a testament to the power of puzzles in pop culture. Plus, they’re just a buttload of fun. Hope you enjoyed this little (animated) trip down memory lane. Until next time, keep calm, puzzle on, and I’ll catch you again soon. This entry was posted in Puzzles and tagged Geeking Out, Pop culture, Puzzlin' fool, Simpsons by gmdirect. Bookmark the permalink.